Therm-a-Rest Tranquility 6 Person Tent is a completely freestanding and unique tunnel-shape design with 2 rooms and 2 doors, for 3-season camping. 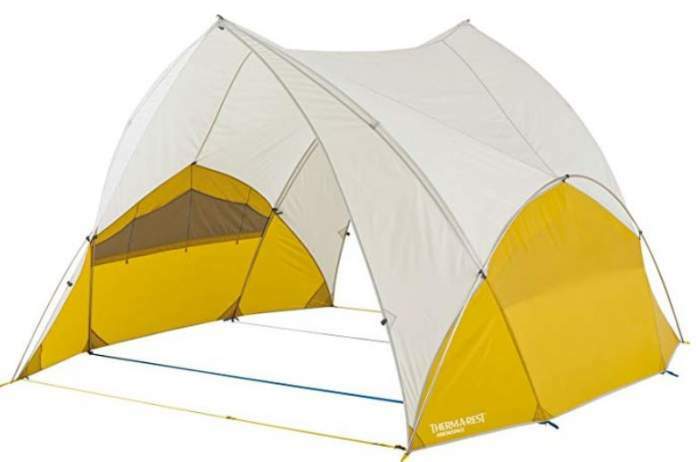 This Tranquility 6 Tent is available on Amazon on the US market and also in some of the EU stores. So follow the link and check if it is available in your local Amazon store, you might save on shipping. Tranquility 6 Tent shown without the fly. The side view showing the unique construction and the two integrated vestibules. Front view through the tent. The divider in the middle of the tent is closed here. Capacity-wise, the manufacturer’s declared capacity is 6 people. But the manufacturer describes this as a snug capacity, and they give 4 as comfort and 3 as spacious. So indeed 6 people would hardly be able to fit in. 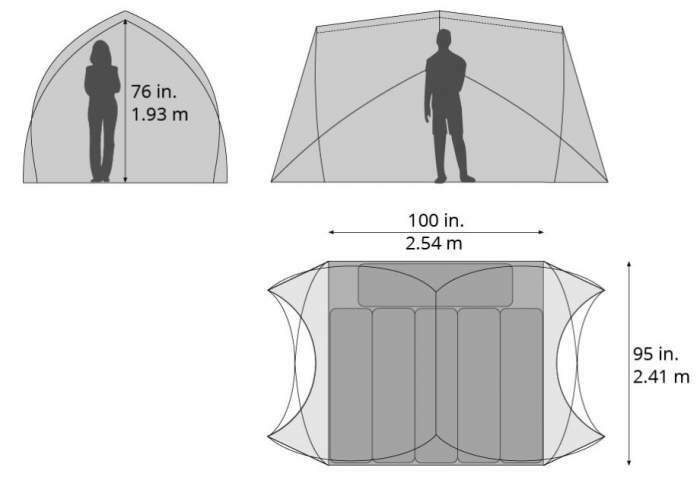 The tent offers 66 ft² (6 m²) of the inner area plus 32 ft² (3 m²) vestibule area. This would in total give 16.3 ft² (1.5 m²) per person which sounds doable but see the inner area. The dimensions and the floor plan. 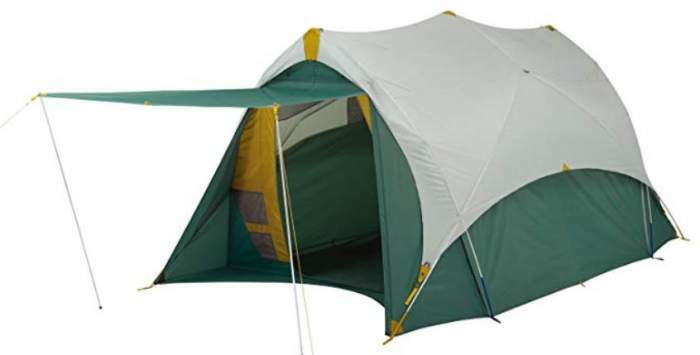 Seasons-wise, this is a tent with a good waterproof rating, but it is very tall and with a partial coverage fly. It will surely protect you from elements, it is strong and stable but I would not use it above the tree line and in a very windy environment. See below how great it looks when the vestibules are zipped and the fly is on. Note also the numerous stake points along its perimeter. Here, the fly is on and the vestibule is closed so the protection is complete. From the pictures above you realize that it has lots of mesh sections on the upper area so perhaps not the best option in a cool environment. But this is a true 3-season tent. 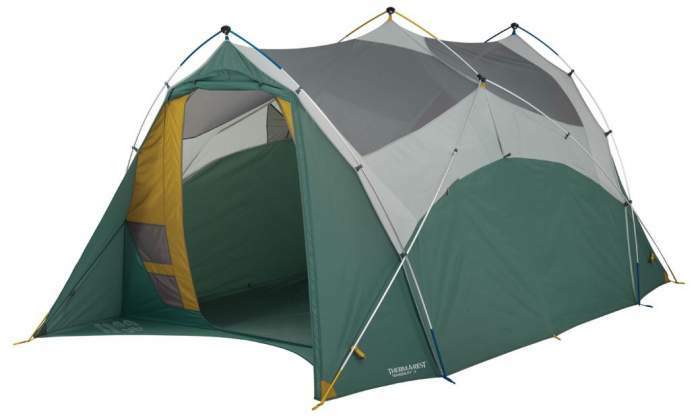 Weight-wise, this is a reasonably lightweight tent. It weighs 18 lbs 4 oz (8.28 kg) and you will see how this compares with some of its competitors, there is a comparison table below. But this is not something to carry on the trail although this is doable. If you need something on the trail better check this list with 6-person backpacking tents. The poles are aluminum and you have them 3. The two poles used at the ends are with a one-hub element on the top, and the central pole is with three hub elements. This is an arched design so the roof is steep and it will not keep water or snow. 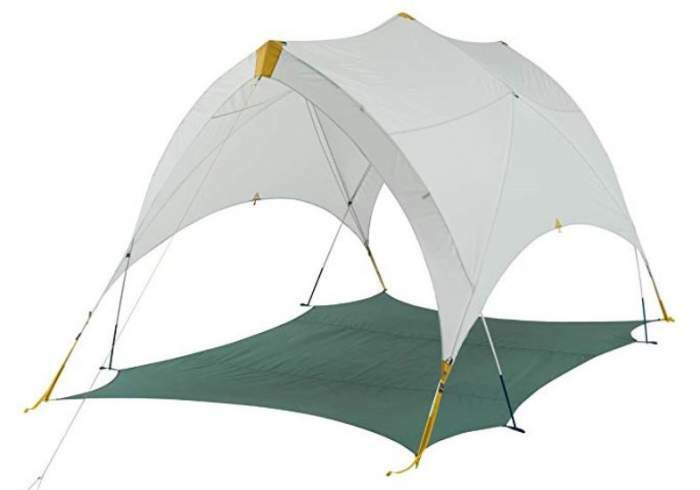 The tent fabric and the fly are a quite durable 68D polyester RipStop with 1500 mm PU coating. You also have a polyester RipStop No-See-Um mesh in the upper areas. The floor fabric is a stronger 150D polyester Oxford with 10000 mm PU coating. These are all great numbers. The vestibules doors allow for awning configurations with some extra poles, see more below. 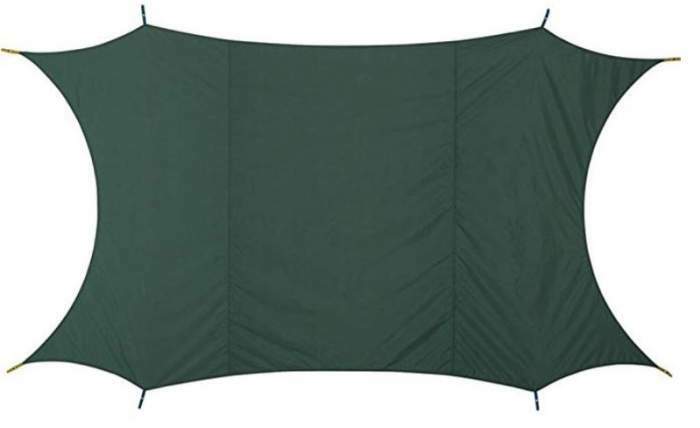 This extends the livable area beyond the tent as long as the sky is clear. There is lots of mesh on the ceiling and on both doors. This is fine as long as there is no rain. But there are no floor vents here which you will need if you have to keep the doors closed. This is my only true objection to this otherwise great tent. Though this can be managed. You can always keep the vestibule partly unzipped above the ground and the inner door can be kept completely open. But to have protection from insects, you can keep the vestibules unzipped as mentioned and keep the inner door with the mesh section only. 4 guy cords with tensioners. There are numerous pockets inside the tent and also in the vestibules area. This is really nicely done. Webbing loops are inside to attach the gear. The vestibules are partly floored in the corners so you can keep the stuff like packs safe from the groundwater. You will see this in the video. You have zippered E-cable ports. Too small for 6 users. Minimum weight: 17 lbs 5 oz (7.85 kg). Packaged weight: 18 lbs 4 oz (8.28 kg). Area: 66 ft² (6 m²). Area per person: 11 ft² (1 m²). Vestibule area: 32 ft² (3 m²). Total area: 98 ft² (9 m²). Total area per person: 16.3 ft² (1.5 m²). Peak height: 76 in (193 cm). 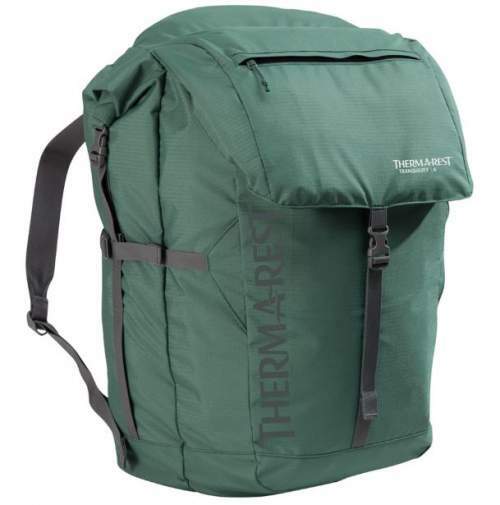 Packed size: 24 x 15 x 11 in (61 x 38 x 28 cm). It is not easy to find something close enough to this design and compare. The Nemo’s tent is closest among the tents presented here in the site. The Big Agnes tent is also with a partial fly but the overall structure is quite different, but note how light it is. 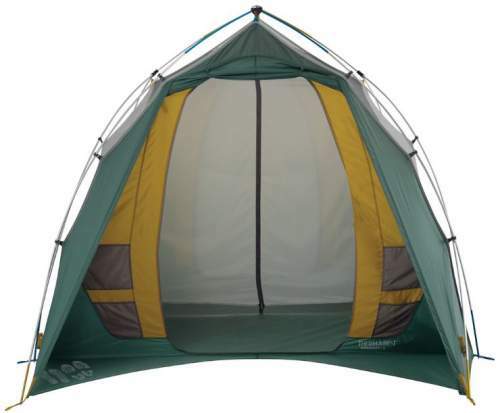 So as you see, you have good vestibules size in this Tranquility 6 tent and you can use them for storage. Please follow the links for updated prices. The awning configuration with the extra pair of poles. The footprint can be ordered separately for the floor protection. It has a very specific shape corresponding to the mentioned partial floor in the vestibules areas. Therm-a-Rest Tranquility 6 Tent Footprint. The Tranquility 6 fast fly setup with the fly, poles, and the footprint. 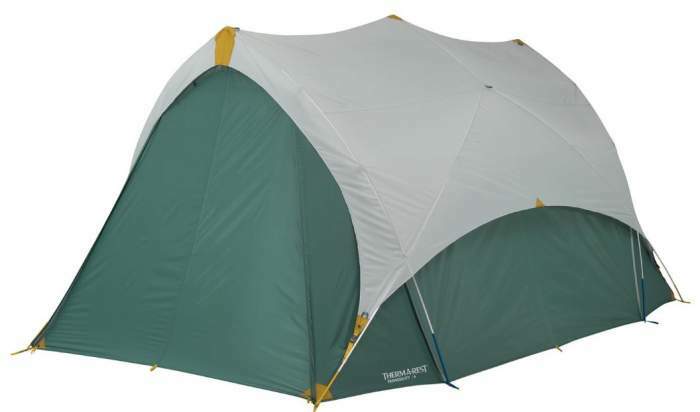 So this Therm-a-Rest Tranquility 6 Person Tent is a great 3-season camping tent which is unique, very reliable, and very functional on its own. But it also allows for several accessory items which increase its functionality even farther. You have here a rarely nicely built tent but this is not surprising, this is a world-renown brand. If you need more options in this size range, please check under the category Tents for 5 & 6 people. You might want to see also this Exped Ursa VI Tent which is a freestanding tunnel tent, and also this The North Face Kaiju 6 tent which is an extended dome type. Please note that this is not a sponsored text and I am not paid by the brand. 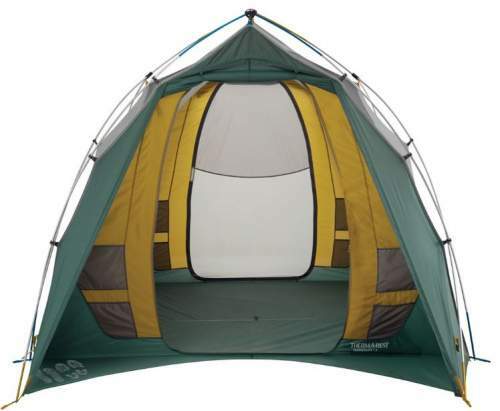 Do you have any experience with this tent? If so, please use the comment box below and share your thoughts here.